Most time travel books have people going into the future to gain an advantage for a problem in their own time or going back to the past to either learn about it, to bring something forward to the future to gain an advantage for a problem there, or to change the future a la John Conner. Author Robert Pielke take us on a new journey in his book. In his story, a time-traveler from the future goes back to the Civil War era to gain help to defeat a future enemy who will also be sent back to the same era. It is speculative fiction, alternative-reality fiction, and scifi all rolled into one. First, in all fairness, I have to write that the reasoning behind this whole venture makes no sense at all. Without giving too much away here, the reason given is that in the future, weapons are too powerful, and when used against the enemy craft, they cause catastrophic reactions which wreck untold havoc, killing off 90% of the future Earth's population. So somehow, the enemy must be attacked with less powerful weapons to disable, but not destroy their craft. Hence, the need to get Civil War weapons to fire on the enemy becomes the raison d'être of the time-traveler's venture. Why future weapons cannot be scaled back is never explained, and this entire proposition is full of so many glaring holes that you can drive a truck through them. However, and this is a big however, there has to be some reason to set up this delicious scenario, and I can't think of a more logical one myself. So I am suspending belief and just accepting it so I can sit back and enjoy the book. Edwin Blair is a history professor from the later half of the 22nd Century. In his time, the Earth is invaded by ravenous "Pests," insect-like creatures intent on denuding the world. After a disastrous attempt to destroy the invaders, the survivors determine that the only way to get rid of them is to somehow transport them back in time to where they can be destroyed by more primitive weapons. The time selected in the US Civil War, at the Battle of Gettysburg, where, while it is not pointed out in the book, more cannons are gathered than at any other time in the Western Hemisphere. Blair, as an American history expert, is picked to return to the era to enlist the help of the fighting forces at Gettysburg to concentrate all their combined fire on two enemy craft which will be sent back in time to the battlefield. Getting opposing forces to cooperate on such a venture is a task which daunts Blair. Full of self doubts, and with a rather frustrating manner of not getting to the point, he first goes back further, to "seed" meetings with future movers-and-shakers by appearing to them at earlier times. He meets up with a young Abraham Lincoln, returning home after two years in Washington as a congressman, and gets him to promise to take a meeting with him some 14 years later...in 1863. The book is engaging, fun, and interesting. Most of the historical accounts ring true. There are a few miss-steps, such as a Mint Julep costing $2 (food riots had taken place at the time because of rising prices, but even then, liquor had risen from 6 cents to 10 cents, and $2 was the going daily wage of a skilled laborer such as a blacksmith.) And I am not sure why a young man would have taken an interest in Chief Joseph the Elder prior to 1863. (Chief Joseph was not a major historical figure of interest at the time. It was after the war that the Nez Pierce and Chief Joseph's son, also named Chief Joseph, came into more notice.) 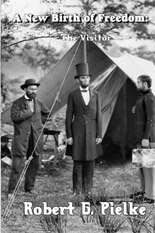 But overall, I enjoyed reading about historical figures such as Lincoln, Hay, Pinkerton, Longstreet, and others from an entirely believable personal perspective. As Blair has managed to change the past, his own future becomes murky. His memory seems to be missing pieces as he tries to figure out what to do next. This book should not be relegated to only scifi fans. It gives us a personal look at history and opens sociological examinations of not only issues such as slavery, but of how people confront new ideas and events. I would recommend this book to anyone, and I eagerly await Book 2 of the series. For more reviews or to buy A New Birth of Freedom from Amazon.com, click here.